These neck scarves are made to US military specifications. 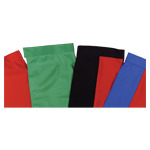 They are made from a soft polyester fabric and feature Velcro closure. These can be laundered or dry cleaned.